A new Million Dollar Dinner manual written by Zone 24 – E/MGA Chris Offer and Zone 24 – MGO Carolyn Ferguson is now available. 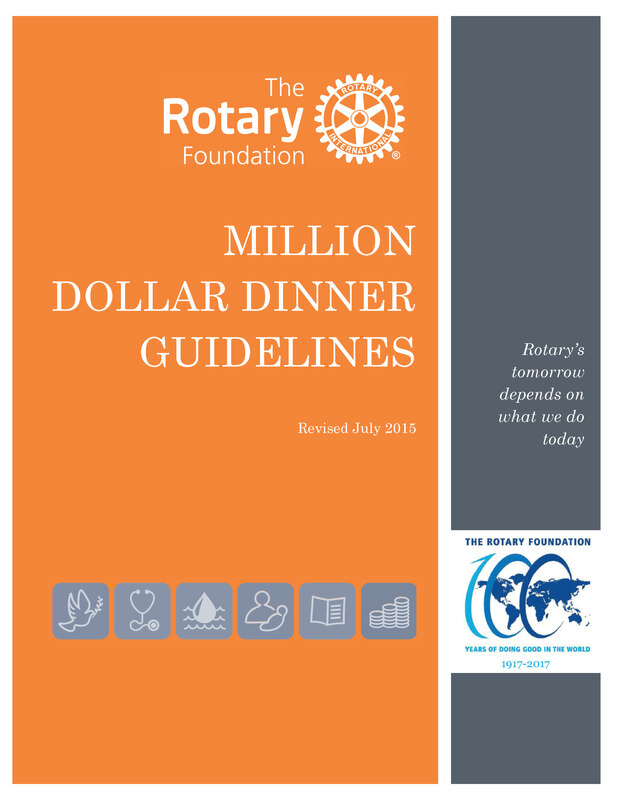 A Rotary Million Dollar Dinner (MDD) is the celebration of a nine to twelve month fundraising campaign for The Rotary Foundation. The evening brings together donors who have made or pledged new contributions or bequests of US$10,000 or more to The Rotary Foundation during the campaign period. The Million Dollar Dinner is a district or multi district sponsored event. It is not sponsored by RI or The Rotary Foundation. The Rotary Foundation does encourage MDDs and recommends the districts utilize the support of the Endowment/Major Gift Advisor (E/MGA) and Major Gift Officer (MGO) assigned to each zone. Districts determine campaign strategies that are appropriate for their region. A senior Rotary leader is the keynote speaker at the dinner. The highlight of the event is the announcement with fanfare of the total amount raised for The Rotary Foundation. Waw! Such an inspiring article. We would love to read the guide and apply it in our Rotaract Global Model UN event. We need more fundraising for scholarships because the applications are awesome but too many times the applicants can’t attend due to financial reasons. Million Dollar Dinner Guidebook is a true inspiration. Thank you again.